The GE 7.0 cu. ft. Chest Freezer is ideal for large families, wholesale club members who buy in bulk or anyone who needs extra space to store frozen foods. It features two sliding lift-out storage baskets to keep items near the top for easy access, while helping you efficiently use the entire 52.4 Gal. of space within. An exterior dial enables no-hassle regulation of the internal temperature between -10 and 15F. 21.7 Cu. Ft. 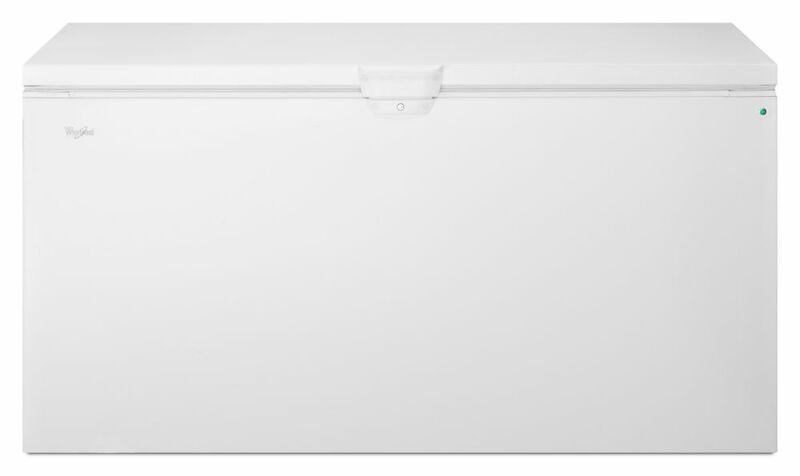 Chest Freezer with Extra-Large Capacity and Temperature Alarm in White is rated 4.6 out of 5 by 48. Rated 4 out of 5 by Joe216 from Good Freezer - Poor Fitting Baskets I have had this Whirlpool 22cf chest freezer for several years and it works great. I don't go into it much and there is no ice inside. The only problem I have, and it can be a real pain, is the baskets fall into the freezer very easily. They don't take very much weight and the tabs on the ends that hold it in place are no long enough. When you load the basket, one side will fall down and jam into the freezer. After unloading the basket and working it loose, you can get pretty frustrated when you figure out the baskets are mostly useless. I like the alarm, though I can't hear it, due to the very high pitch, others can. What good is a power light if something else is wrong? The low temp warning could save your food and $$. Wish they made a larger size.